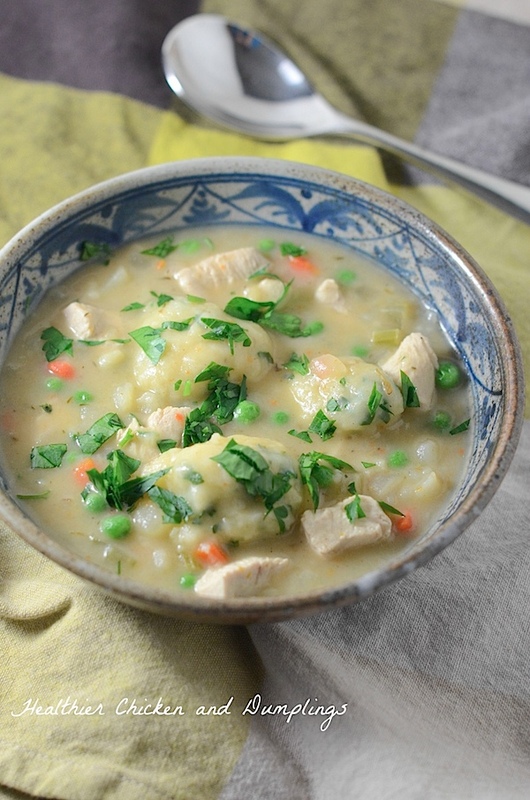 Who says comfort food has to be unhealthy? 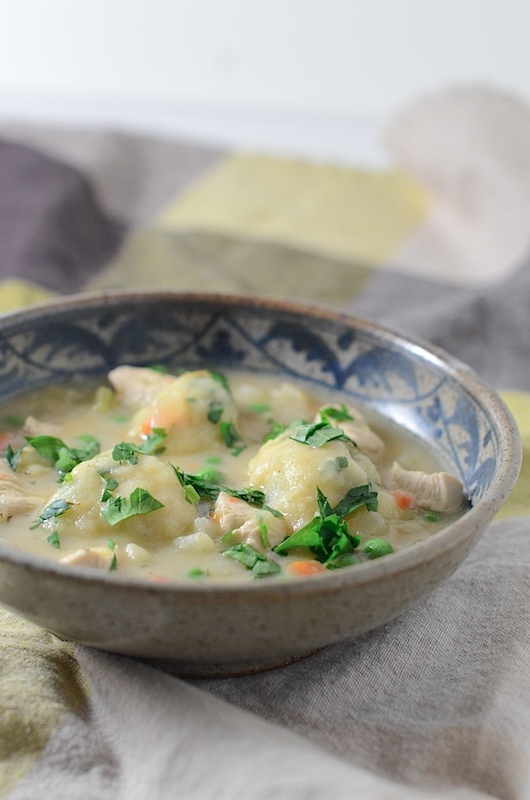 I think a cozy bowl of this Healthier Chicken and Dumplings recipe is perfect for a cold or rainy day. We definitely make this a few times during the fall and winter seasons. Most recipes I found online recommended boxed biscuit mix. As a clean eater, I try to avoid boxed anything whenever possible. And as it turns out, from-scratch dumplings are pretty darn simple! The base recipe is actually really great, so I didn’t have to change it too much. It’s simple and fast. Hello, 30 Minute Meals! But, I didn’t love using boxed biscuit mix for the dumplings. Some of those boxed mixes throw in some interesting extras by way of ingredients that Michael Pollan wouldn’t approve. Speaking of Pollan, I love his straightforward approach to eating as outlined in Food Rules, and it’s probably one of the most influential books I’ve read for my take on healthy eating. His advice is practical and easy to apply, and I thought about it when I adjusted this recipe. From extra biscuit mix ingredients to straight up biscuit ingredients, I made this a little extra clean-eats. 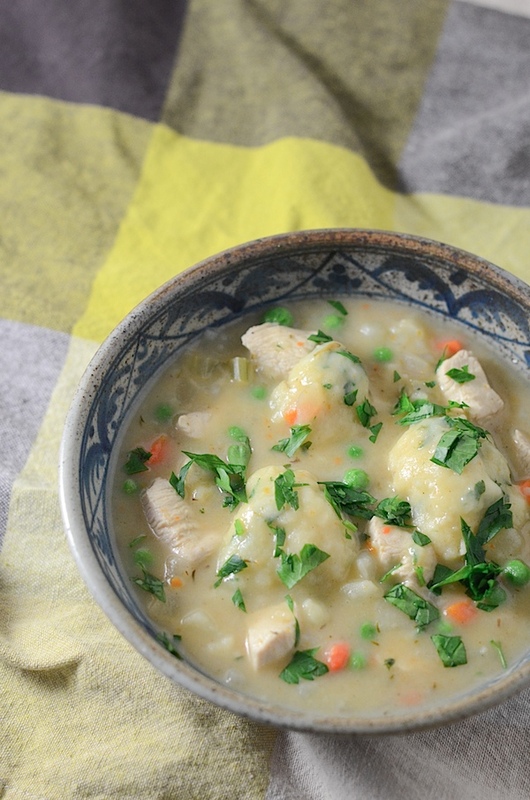 Here’s a Healthier Chicken and Dumplings Recipe to try out sometime soon. I adapted this recipe from the 30 Minute Meals recipe to make the biscuits from scratch (with a couple other minor changes). It’s really just as easy as using the boxed stuff without the unnecessary added yucky ingredients. Don’t skip the parsley. It’s so good for you and high in vitamin C. Try using whole grains for the biscuit mix to take the health factor up a notch. I really like using spelt flour because the texture is pretty fluffy for a whole grain flour. Pre-heat a large pot on the stove over medium heat. Add oil, potato, carrots, onion, and celery, and cook until onions are translucent, about 5 minutes. Stir in bay leaf, poultry seasoning, salt, and pepper. Add 2 tablespoons butter and melt, stirring a little. Add 2 tablespoons flour to the pan and cook 2 minutes, stirring with a whisk. Whisk in broth or stock and bring to a boil. Add chicken to the broth and stir. In a medium bowl, stir 1 cup flour, baking powder, and salt until evenly combined. Cut 2 tablespoons butter into small cubes. Cut butter into the flour mixture with a pastry cutter or fork until the mixture resembles coarse crumbs. Stir in milk and 1/4 cup parsley until the mixture is just evenly combined (be careful to not over mix). Drop tablespoonfuls of flour mixture into the pot, spacing dumplings evenly. Cover pot and reduce heat to simmer. Steam dumplings 8 to 10 minutes. Remove cover and stir in peas. Cook until peas are warmed through, about 1 minute. Taste test and add salt and/or pepper, if needed. Serve, garnish with extra parsley, and enjoy! Sometimes it’s hard to find 1 1/2 pounds of chicken at the grocery store. I find that anywhere between 1 and 1 1/2 pounds works okay. You’ll just have a lot more of the veggies and biscuits if you go towards the lower amount of chicken, but you can still make it work. Thanks for stopping by! 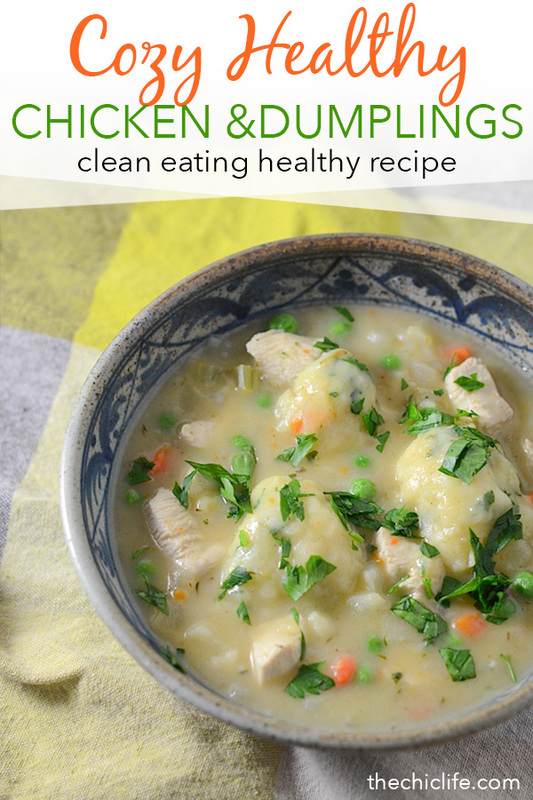 Hope you enjoy this clean eating Healthier Chicken and Dumplings Recipe! Hi Diana — met you at last month’s Charlotte WordPress Meetup. I’m super thoroughly impressed with your blog!! Insightful, entertaining, thoughtful, colorful! And I’ll definitely be trying out this recipe tomorrow night — I’m looking for something different from my usual baked chicken. Will let you know how it goes =). Let’s stay in touch! Hi Brandon! It’s great to hear from you. Thanks for the kind words and stopping by my blog. Hope you like the recipe. Definitely let me know how it works out for you. Let me know too if your friend wants to chat about starting a blog for her homemade bath goodies. Stay in touch and see you at the next event!